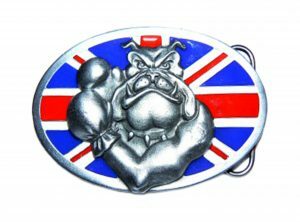 This is our Boxing Bully Bulldog Belt Buckle. The Boxing Bully figure is set in relief against the backdrop of the Union Jack on an oval shaped buckle which is inlaid with red, white and blue enamel. He’s British, he’s boxing and he’s a Bulldog! This would make a superb mascot for a real superhero!